Working from home, while wonderful in many ways, has its perils. On some days, for instance, it’s tempting to answer “Leonard Lopate” or “Terry Gross” when your daughter asks you who your best friend is. If I’m not actively fighting the urge, it’s also incredibly easy to get sucked into what I’ve been calling the Double F Vortex, i.e. the condition where you find your house default position to be in front of the Fridge or Facebook. Even worse, I’ll get locked into some work project in my upstairs office, look at the clock, realize that I haven’t eaten in six hours and that the girls have to be picked up from school in mere minutes, which means I rush to the kitchen to start inhaling whatever is grabbable: a piece of string cheese, a handful of grapes, the last few roasted pepitas in the plastic pouch which I throw back like a funneling fratboy. A few buttery crackers, a sea salt potato chip or two or eight. Oh, and look at those Easter baskets just begging to be raided! Two bright purple Peeps later I’m hating myself. And by the time I pick up the girls, all I want to do is take a nap. 2) Snack Once Mid-Morning. If I have a glass of Pomegranate kefir, a crisp Bosc pear, or a Finn Crisp schmeared with a thin layer of peanut butter at 11:00, I am much less likely to transform into a wild animal come lunch time. 3) Eat Healthy Proper, Sit-Down Lunches. This is hard, because I’m always on the clock — rushing to get something done before the school bell rings — but I’m using my Culinary Intelligence and following Peter Kaminsky’s lead to make this meal as satisfying as possible. Kaminsky’s theory makes a lot of sense to me: If you load up on healthy foods that are high in flavor, you won’t be tempted to polish off that meal with, say, a Cadbury Cream Egg. This one above fits the bill. 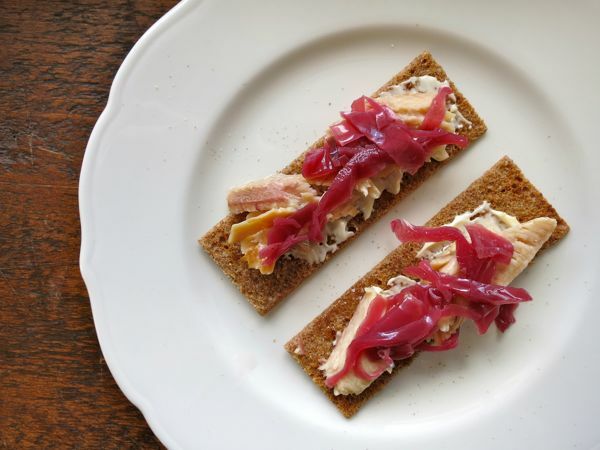 It’s two Finn Crisps topped with smoked trout (look for the blue tins near the tuna and anchovies at Trader Joe’s) and pickled cabbage. If you are not lucky enough to have a batch of Andy’s Mind. Blowing. Pickled Cabbage lying around, cornichons or regular old pickles will do just fine. 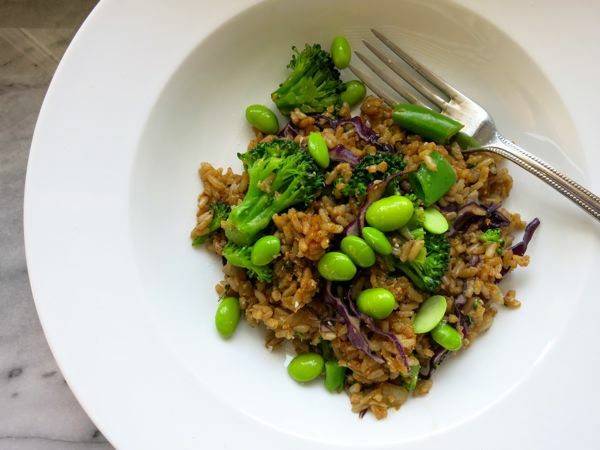 On Monday, all it took was a big bowl of leftover steamed broccoli and a bag of pre-cooked Trader Joe’s Brown Rice to get me rolling on a vegetable-loaded fried rice. Since I’m not generally in the habit of mincing and whisking and turning on the stove for lunch, I made a double batch so Tuesday’s lunch would be taken care of. It was delicious and can definitely be doubled to feed four for dinner. Add oil to a large skillet set over heat to medium heat. Add onions and ginger and cook until onions are slightly softened, about one minute. Turn heat to medium-high and add rice in one layer so as many of the grains are crisping on the hot pan as possible. Cook about a minute stirring once half way. Push rice to edges of pan and add egg to the center, scrambling with your spoon and gradually pulling in rice as it cooks. Stir in soy sauce and cook another minute until everything is integrated. Add vegetables and cook until everything is heated through, another minute. Drizzle with Sriracha if desired. Yum, yum, yum. And solid ideas. I was telling my husband I should discipline myself to a simple breakfast everyday-egg on toast or oatmeal, a salad for lunch, and whatever we want for dinner (within reason, usually home cooked anyways). I didn’t know Mark Bittman was putting his Vegan Before 6 PM concept to a book and that really excites me! I really needed this post today Jenny! Really. Thanks for great ideas to inspire me to avoid the tortilla chip lunch. . .
All fantastic ideas, I can’t wait to try them! I just requested the Vegan Before 6 book from my library, I adore Bittman’s books, so this will probably be purchased after I read the library copy. I also wanted to say thank you again for recommending ‘Salt, Sugar, Fat’ by Michael Moss. I am 1/4 way through the Sugar part and immediately stopped buying those delicious, yet 16 grams of sugar, mini yogurts from Trader Joes. Instead I bought some glass yogurt jars with lids online and now we just put frozen fruit mixed with honey on the bottom with plain yogurt on top. Little changes like this can go a long way, just like your snacks. I am dying to try the Crackers with pickled cabbage now! These all look GREAT! 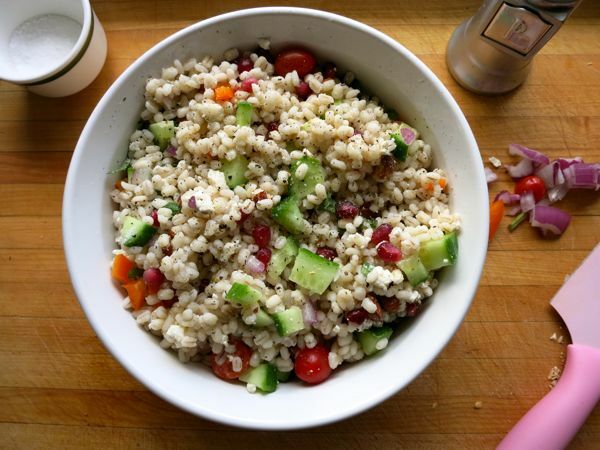 That barley salad. Oh my. Gotta make. Really intrigued to see that Bittman book! You made me pre-order Bittman’s book. You are bad for my wallet, book-wise. But I love your ideas and we’re incorporating them into our daily dinners. Especially deconstructing dinners is a lifesaver for a family with four differently picky kids. I’m always looking for lunch ideas so I don’t feed my one year old scrambled egg & toast every day. You may have done this already, and I will do a search, but I’d love a list of your Trader Joe’s favorites. What a coincidence, fried rice is on the menu for tomorrow. I just cooked the rice. It is a great way to clean out the veggies. And here is another — which was one of the first posts I ever wrote on this blog so forgive the awful photography. I was still figuring things out! 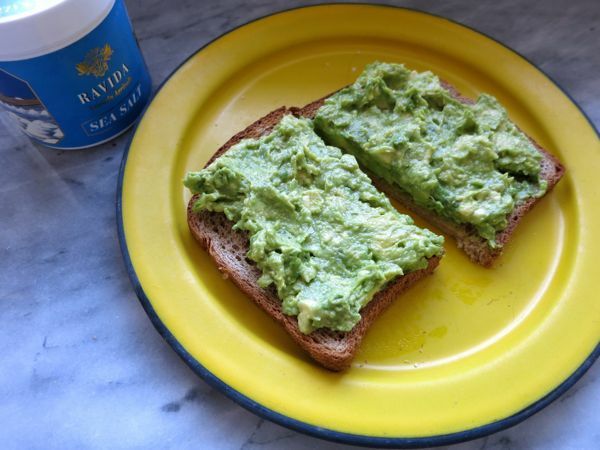 Avocado smashed on walking bread might be the cure all for the needed nosh. These are really great tips. I was just reading an article in my Nutrition Action magazine about getting “tricked” into eating more. Have food in eyesight view is a biggie! There is only so long I can stare at my half eaten Easter basket without polishing off the jelly beans! This fried rice is basically exactly what we had for dinner tonight. As a full-time mom, this post is just what I needed. Thanks! I am always thinking about how to eat healthier too and I really like your tip about snacking bet. breakfast and lunch. Lately what I’ve been trying to do is sneak in more vegetables, especially green ones, into every meal: In omelets and on toast for breakfast, in salads, pastas, and sandwiches for lunch and dinner. And into smoothies too! Avocado on toast is my answer to the question of what to eat, no matter what meal (or snack) the question concerns. Love the other ideas too. And can’t wait for Bittman’s book. Thanks Jenny! If you don’t mind eating leftovers, you could make larger quantities of the evening meal (ie, cook for 5-6 if you are 4), and reheat for lunch. We eat a late (8-9 pm), heavy supper (fish or meat, LOTS of veg, a small amount of carbs), and I find that this tides me over until lunchtime the following day, with no need for breakfast. Basically, I eat 2 full meals a day, and have no urge to snack in between. If I’m on the go and can only grab a sandwich or pasta salad, though, I am STARVING and weak by late afternoon. I need fat and protein to give me energy and keep the munchies at bay! Such a wonderful post! As I consumed a leftover chicken hot dog off my kids plate for lunch yesterday I realized I needed to perhaps plan my lunches a bit better. When I’m on top of things I steal the kids divided lunch containers and fill the big section w greens, the small section w beans and chopped veggie and then grab that for lunch topped w hummus dressing or something of the sort. If I don’t plan and prep I definitely end up eating leftover kid grilled cheese. I am making your fried rice immediately! Great recipe. i am seriously in awe of you. The fact that you can cut open an avocado and eat only 3/4 and save the rest for Phoebe…??? i suspect i shall never know such true love for another. One of my own steps to healthier days was to give up snacks. I did this over 10 years ago. Like Zelda above, I usually eat only two meals daily (lunch and dinner) and don’t snack. Sometimes lunch is leftovers, but more often it’s some kind of homemade soup, bread and fruit. This stuff is truly unreal. I honestly want to just eat it with a spoon sometimes! Great tips and tricks 🙂 For the first time in my life, I’m noticing my waistline and my diet are not mutually exclusive, and what I eat IS affecting my body. Goodbye young-adult metabolism! I keep overdoing it snackwise, and would really like to fit into my entire drawer of jeans that fit me last year… These tips are really able to be tailored to anyone, and aren’t crazy changes. I’ll be keeping them in mind! This is a very timely post for me. I work from home… I’ve put on 20 lbs in the last year!! Many things to blame; among them, mindless eating and finishing all my toddler’s meals (before eating my own). This month I am doing a vegan challenge to try to kick start healthier eating. For April I’ve also given up Facebook (it really is a time-sucking distraction), Netflix (ditto), and drinking. I agree that sitting to eat lunch is important. I make my lunch and put all ingredients away before I dig in, so there’s less temptation to just “have a second sandwich”. Needless to say I cannot wait for May 1! I love new lunch ideas, so thank you. Egg salad made with hard boiled eggs and Todd’s Minty Pea Dip. So. Good. Ooooh, the double F vortex really hit home. I work from home and the siren song of the fridge is… well, there’s a reason they call it a ‘siren song,’ right? dammit! (oops, sorry) just tried to reach through my screen for that little trout/cabbage tartine number, and darned if I couldn’t get it out. Mindless Eating is a great book! Going to make pickled cabbage. What is pomegranate kefir? I just started making my own kefir and it’s so easy it’s stupid – much easier than yogurt, even. wait, I followed the pickled cabbage link from this post and it was to dill pickles? Or is it the same recipe, just subbing in cabbage for the cukes?? Seconding Margo’s request for the pickled cabbage recipe!!! I searched your site and couldn’t find it. It sounds so delicious! Sorry! Kirsten and Margo – yes! It’s the same link as the pickled cucumbers; but just use red shredded cabbage instead of cucumbers! Apologies if that wasn’t clear. It is so true, sometimes I find myself eating for no good reason and the children’s easter eggs are certainly proving a challenge to avoid. Thanks to your post I sidestepped the chilli rice crackers and went for red cabbage salad instead. We had the fried rice with an easy stir fry pork (just pork, soy sauce and garlic) for dinner and my entire family (kids ages 6, 8 and 10) all loved it. Granted, my daughter ate the fried rice deconstructed style (brown rice with a side of broccoli) but we were all happy! Fabulous suggestions! Cheers to the work from home mama’s!